Yes. The easy to make, cheese eyes have me hooked so expect to see more of them. An easy bento to put together with quick chicken teriyaki. I sliced the chicken teriyaki for easier eating, then added eyes because it reminded me of a fat earthworm. Either that or a trilobite? He’s resting on a bed of rice, microwaved from the freezer so that was easy too. As a side, I added two different Even Fancier Fishballsâ„¢; the white one with orange inside is crab roe, the green one is crabstick. For easier eating—they’re very slippery with chopsticks, I sliced them in half already. To season, I included a soy-fish with ponzu. Funny when you think about it. The worm’s much larger than the fish. To balance the meal, I prepared a small kani salad, made of shredded iceberg lettuce, shredded crabstick, diced peaches, nori cut into stars and a little Hello Kitty cup of kewpie mayonnaise. All in all, a crunchy (thanks to the salad) and flavorful meal, prepared in roughly 20 minutes. Yay! Take that, Rachel Ray! It’s so adorable!! It’d be great for kiddie baons too. Yefyef! 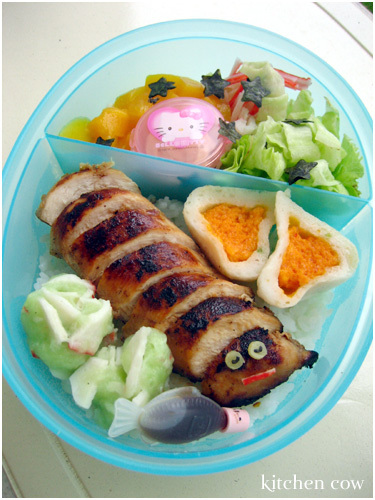 actually, i think all bento’s good for kiddie baon. I added you to my Google reader. I love the way you present your food. Keep the great ideas coming, k?